Groin pain is a major cause of time lost from sport. The groin is the link between the moving mass of the torso and the propelling forces provided by the leg. As the forces required for propulsion, change of direction and acceleration are centred through this region great stability is also required. If this stability is compromised then gradually the forces applied cause overload to this region. When progressive overload occurs there may be a gradual breakdown of tissue tolerance. Symptoms then begin to affect performance, limiting acceleration, direction change and kicking ability. Our Groin Clinic Clinicians treat patients presenting with Groin pain on a daily basis and have contributed to this handy infographic detailing facts and figures surrounding Groin injuries. Running a marathon is an attractive challenge for most runners. Whether it is to cover the distance or achieve a particular time goal, the physical demands of a marathon must not be underestimated. Many athletes get injured or pick up small niggles in the final 12 weeks before a marathon race when the training volume and intensity is at its most severe. Athletes are simply trying to do that high volume training with poor running mechanics. Running is a skill in itself and one that is seldom learned or practiced. It is when we place greater demands on our bodies that our unlearned running styles begin to cause problems. 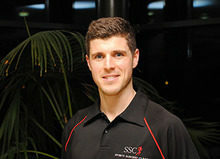 Read part one of our Marathon Training blog by Colin Griffin Running Re-Education Coach at SSC. Our team of Orthopaedic Surgeons at Sports Surgery Clinic perform over 600 ACL reconstructions each year. Read this handy infographic detailing facts and figures surrounding ACL injuries. Infographic – Sacroiliac Joint Pain facts and figures. Our team of Clinicians in our Sports Medicine and Physiotherapy Departments regularly treat patients, many of whom are Golfers, presenting with Sacroiliac and Low back pain. Issues surrounding the Sacroiliac Joint have become very topical in recent times given the high profile injury to tiger Woods and his subsequent withdrawal from the Ryder Cup. What exactly is Sacroiliac Joint Pain and how does low back affect Golfers? Read this handy Infographic to learn more. Dr Martin Hagglund discusses the impact too many games has on players today. In 1999/2000 former president of UEFA Nils Lennart Johansson initiated a football injury research project, the aim of the study was to reduce the number and severity of injuries in football, and ultimately improve the safety of players. Now entering its 16th year, the group, led by Professor Jan Ekstrand (Vice-chairman of the UEFA Medical Committee and professor at Linköping University, Sweden) has studied data from some of Europe’s top clubs spread across 10 countries. Martin Hagglund, an Associate Professor and colleague of Professor Ekstrand at Linkoping University and a member of the UEFA Injury study group, is better placed than most to talk about the impact of match congestion and injury rates. Watch his interview filmed at SSC’s 2014 Football Conference here. The club versus country debate is a thorny issue when it comes to International football. All too often, especially when he it comes to perceived meaningless friendlies, key players return to their clubs with slight strains only to appear the following weekend. With16 years’ experience of working with the Irish national team, Senior Physiotherapist Ciaran Murray, is better placed than most to talk about player management in this interview given at the recent Sports Surgery Clinic Football Conference.